You need more than just a good level of English to communicate successfully in international business. Collins Effective International Business Communication gives you clear and practical advice to help you to communicate successfully with colleagues and business partners around the world, using the English you already know. • Part 1 will help you with speaking and listening, with practical ideas to help you create better understanding with colleagues and business partners. • Part 2 covers key interpersonal skills , such as building relationships, networking, influencing, making decisions, managing conflict and building trust. • Part 3 considers the challenges of virtual communication with colleagues at a distance, with advice on how to write better emails and manage conference calls. Work environments today are increasingly complex – with greater demands on time there is more emphasis on choosing the right form of communication at the right time. You need to be able to work with colleagues at a distance and build and maintain relationships with people at home and abroad. 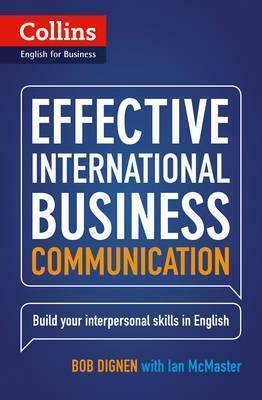 Effective International Business Communication will help you to build the relationships you need to be successful.